1. 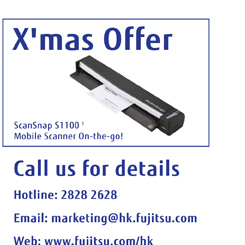 Free ScanSnap S1100 X'mas offer is only applicable to new Fujitsu Hong Kong customer. 2. The promotion is valid until 24 December 2013. 3. The promotion offer applies to Hong Kong and Macau markets only. 4. All pictures are for reference only. 5. In case of disputes, decision of Fujitsu Hong Kong Limited remains final.